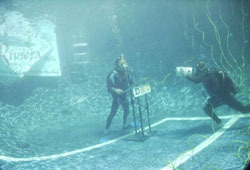 On Friday, October 7th, the final day of DEMA Show 2005, fifteen members of the media made history by participating in the world’s largest underwater press conference. The event took place at the Riviera Hotel and Casino, which was, coincidentally, celebrating its 50th birthday. 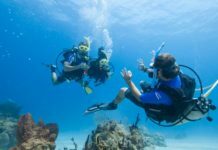 Early that morning, participants were fitted and equiped with gear and wetsuits by David Reidenbach, Director of DEMA’s The Scuba Tour, a traveling program to raise awareness of the dive industry and introduce new people into the diving world in a non-threatening environment. 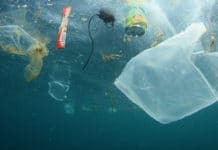 The would be record holders then donned and learned how to use the Interspiro Divator MKII full face masks and underwater communication systems provided by Ocean Technology Systems. 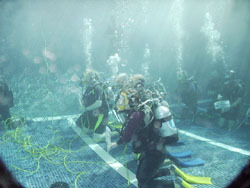 Once familiar and comfortable with the new equipment, the underwater journalists then connected their individual communication links and descended to the underwater stage, where history would soon be made. 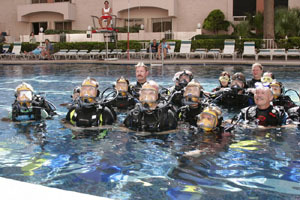 At 12:00 noon, local time, the satellite link went live, and with everyone listening intently, both topside and underwater, Al Hornsby, President of the DEMA Board of Directors, announced the launch of www.demaauction.com, a new DEMA-sponsored website through which Association members can donate items to be auctioned to the general public. 100% of the winning bid on each auction item will be donated to aid the victims of Hurricanes Katrina and Rita. The online auction site is a joint initiative with the American Red Cross, and is expected to go live on 01 November 2005 with items such as dive gear and electronics, eyewear, t-shirts, trips to exotic destinations and marine-inspired artwork. The site will be available for one month, and will close on 30 November. If successful, www.demaauction.com will likely accomodate and benefit other disaster relief efforts and programs in the future. “We are excited to be the organization behind this history-making event, which puts the spotlight not only on the sport of scuba diving and the amazing technological advances in equipment that we hope will entice even more people to take up diving, but to also focus on the first of DEMA’s disaster relief efforts, www.demaauction.com, which in this case will help the victims of Hurricanes Katrina and Rita”, said Al Hornsby. The International team of journalists who joined together for the event was comprised of Don Brown, Svetlana Murashkina, Stephan Whelan (DeeperBlue), Joe Cocozza, Tara Bradley, Mike Hughes, Ken English, Rosemary Lunn, Denise Mattia, Stuart Westmoreland, Peter Murray, Linda Lee Walden, John Liang (DeeperBlue), Nico Danan (DeeperBlue), and Christopher Chin (DeeperBlue).  The team was joined by DEMA Scuba Tour Director, Dave Reidenbach. All of the participants are eagerly awaiting their final designation as Guinness World Record holders pending authentication of the video tape of the event by Guinness Book of Records, London. 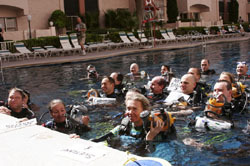 The previous world record was set near the Canary Islands in June 1997 by twelve Spanish journalists.